It’s the end of the summer, which means you want to enjoy looking out to your backyard or front yard for as long as possible. You can bask in the view of seeing the beauty of the sunsets or the sunrises. With cared for windows, you can look out to your neighborhood and appreciate seeing your community going about their business. Even though your windows are clean thanks to our window washing service, you want to make sure that your window screens are immaculate as well. One of the many services we offer at ProClean Windows is screen cleaning. However, we know that you also want to learn how to maintain your window screens and to do that you need to properly care for them. As Utah’s Top Rated Local® Window Cleaners, we provide top-quality services. For those who want a window washing service that’s reliable and will treat your home with care, then call on ProClean Windows. We offer an array of options for your schedule and we’ll be there in a jiffy. 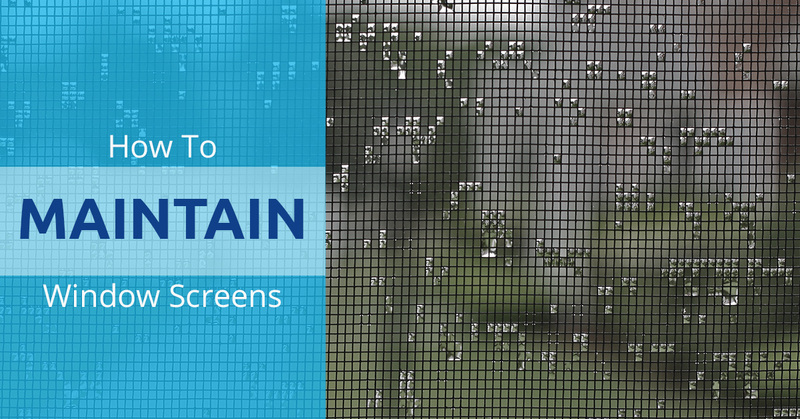 We provided three steps to ensure you are caring for your window screens properly. In between visits from our window washing service, it’s important that you are attentive to cleaning your windows. It might not seem like a big deal to clean windows, but in reality, if you don’t take care for your window screens, then they’ll become caked with debris and end up costing you more money. No one wants to spend more money on their home than they already do, so take care of your window screens before they become too damaged and you end up shopping for new ones. The first step to maintaining your window screens is to gather the proper tools to clean them. You don’t want to just take soapy water and pour it through the screen nor do you want to use just any type of tool to tidy them up. To properly care for the window screens, like anything in your home, you want to pick the right tools. These tools include a large basin or a tub that can fit the window screen, a synthetic or a soft brush, a garden hose to make cleaning the window screens off easier, and dish soap. Once you’ve gathered all of your necessities, it’s time for you to find an open space to start cleaning. We recommend a backyard, but a garage works well too. As long as the hose can reach your cleaning area, you should be in good shape. You can begin to clean the screen either by dunking it in the basin and gently scrubbing it with the soft bristled brushes to get the grime and the debris away or you can have the bucket nearby with the soap and clean it outside of the tub of water. Regardless of the way you decide to clean the screen, make sure it’s out of the window and you scrub at it gently. You don’t want to pop a hole in the screen because you were scrubbing at it too hard. The scrubbing isn’t a difficult part, it’s just time consuming and you’ll probably get a little dirty. Make sure you brush in both directions and on both sides so you get in between every inch of the screen. Once you’re finished with cleaning the screen, take the hose and begin to get rid of all the soap on the window screens. Make sure that you don’t have the hose on high because you don’t want to blast a hole through the screen. The drying process is easier than you may think. If it’s a nice, sunny, hot day then you could leave the screens in the yard to dry off. You can also gently shake the window screen to get rid of the excess water. Another suggestion is to take a towel you don’t care about and gently pat it down. If you don’t have the time to clean your window screens, you can always call on our window washing service.